Well, hello there! We’re happy that you’ve found us, but you may be wondering exactly what you’ve found. We understand, and this long-winded page will hopefully help to answer those questions. This project will be released over the course of a dozen podcasts in a Radio Drama format, culminating in a final feature-length audio experience presentation. This means that you will not be watching our story, but rather listening to it as told via narration, voice actors, music, and sound effects. Phew! All those bullet points would’ve made for far too long of a title. 😉 It’s important to note, too, that we have not created our unofficial, alternate Episode IX to disparage Star Wars in any way. When the official Episode IX comes out in theaters, please be sure to go out and see it! We here at EpisodeIX.org are all big fans of the franchise and are excited to see what’s both on the horizon and far down the road in this historic universe. Now that that’s out of the way, let’s dive a little deeper into who we are and what it is we’re doing here at EpisodeIX.org. This is a not-for-profit, fan project and everyone has been generous enough to volunteer their skills towards making, what we hope, will be a truly amazing final product that will immerse listeners in the rich universe of Star Wars in a completely new and different way then they ever have before. Everyone involved with EpisodeIX.org is kindly giving of their time and abilities freely. 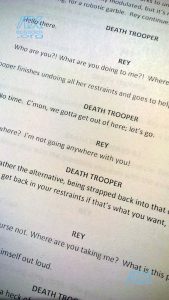 The Unofficial Alternate Episode IX Radio Drama will be given away for free in 2019 over the course of about a dozen 10-15 minute podcasts, and then in a final, assembled feature-length audio novel. More information about the releases will come as we get closer towards our first one. Remember, subscribers to our free e-newsletter, The Commlink, will get the news, and the releases, first before anyone else; so be sure to subscribe today! The genesis of EpisodeIX.org all began with the story. 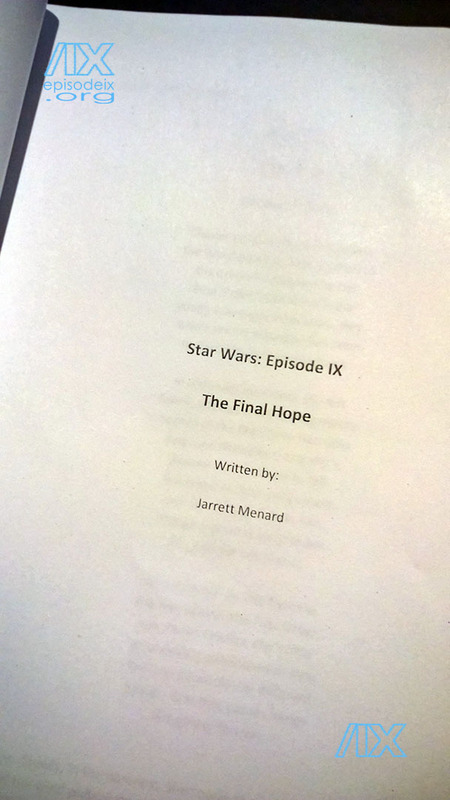 The script was originally written by aspiring screenwriter Jarrett Menard out of a place of love for the franchise, it’s characters, and the mythology of George Lucas’s wondrous universe. It came to him shortly after watching “The Last Jedi” on opening day, and he couldn’t get it out of his head. He spent nearly three weeks straight typing it down as fast as his fingers would move, like trying to capture lightning in a bottle before it was gone. When the smoke cleared and the paper settled down on the table, he was left with 172 pages of what he hoped was not just a great story, but a fitting ending to the Skywalker Saga. It was kept shrouded in secrecy even though he knew that there was practically a o% chance that anyone in Hollywood would even look at an unsolicited script, (and one for Star Wars, no less). In the end, he ignored the odds and sent it out anyways. Over time, the scripts began to find their way back to him, returned due to the legal reasons surrounding unsolicited scripts. Disappointing, but not surprised, after much coaxing he decided to share it with three of his friends who had varying levels of knowledge and love for Star Wars to see what their reactions were. The feedback was phenomenal; two hour and forty-five minute running time be damned. No one wanted this script to die, and everyone couldn’t believe that it wasn’t even given a chance to live. One of the reviewers suggested trying to get it out to the world in some manner that people could enjoy it. One of Jarrett’s young sons innocently and sweetly asked why he couldn’t just make the movie himself; which leads to the next question you may have. “Wait, what? There’s no VIDEO? !” It’s true, in this day and age, ordinary people are making extraordinary fan films for just about everything, and those that really pour themselves into it can kick out some truly amazing productions. “Star Wars: Dark Legacy” or James Cawley’s “Star Trek: New Voyages” series, to name only two, spring to mind as great examples of what talented, dedicated, everyday people can produce if they put all their efforts and time into it. We here at EpisodeIX.org definitely have the passion. We feel “we have the tools, we have the talent”, to quote another franchise. But we also have such a clear vision of this story being performed by the talented actors and actresses that already fill these roles. To just make a fan film and sub in a local talent to, for example say, portray Rey instead of the talented Ms. Daisy Ridley, seems like a disservice to the story, the cast, and the fans. So we pondered on what we could do instead. 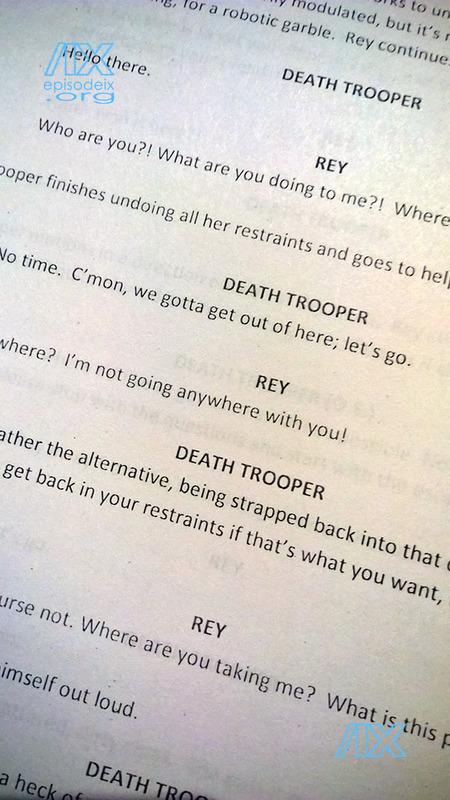 Reflecting on the very first thing an audience member sees in a Star Wars feature film, “A long time ago”, the idea of series of podcasts culminating in a final feature-length presentation, all done in the vintage style of a radio drama, came about. As the reviewer who suggested finding a way to bring the script to life is a musical composer who already professed he could hear the score coming together in his mind, this seemed like the perfect way to share this story with the world. Death Trooper vs. Rey, or with Rey? So they teamed up to bring it to fruition, but decided to make it extra special by doing it for an even greater reason than just their love of Star Wars and the story Jarrett had written. That reason was to help raise awareness for the annual Extra Life children’s charity event that benefits Children’s Miracle Network Hospitals. Jarrett has hosted an Extra Life event for the past six years, and in an effort to switch things up a bit we’ve decided to incorporate the radio drama into it to potentially generate some generous tax-free donations for their cause. So that being said, we’re off on a Kessel Run of our own! The script has been written, new music is being composed, and a narrator and voice actors are being auditioned and selected. As a small visual aide, storyboards are being drawn up to accompany the audio; hopefully “punching up” a scene when a key moment happens in the dialog. Our greatest hope is to present you all with something that as many people as possible will enjoy, including those that have been feeling more and more disillusioned by the current slate of rapidly released movies. We’re aiming to bring the final trilogy in the Skywalker Saga together in what will feel like a natural and rewarding conclusion for these beloved characters; giving them the fitting sendoff that they all deserve. So stick with us, won’t you; because in the end, the real theme of this 9-part saga boils down to one thing. Have you felt it?